SEO may be the new platform, but it’s still all about asking for referrals. Before the internet, if a new homeowner needed a plumber to fix something in their home, they asked their family, friends, coworkers, neighbors, etc. 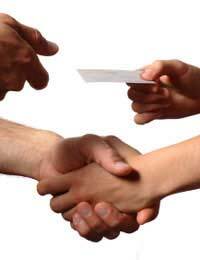 for referrals for a good person to do the work. This might result in a list of names of plumbers to take a look at, including multiple people recommending the same plumber. When faced with a decision, the new homeowner, in this scenario, is probably most likely to choose the plumber with the largest number of referrals. This scenario is not a far cry from how Search Engine Optimization (SEO) works. According Brian Clark, author of Copyblogger, in a post about SEO copywriting, “Modern SEO is all about crafting content so compelling that other people want to promote it by linking to it or sharing it, which increases your trust and authority and helps the pages you want to rank well for certain keywords.” This statement is supported by SEOmoz’s Search Engine 2009 Ranking Factors report. The report shows that the largest portion (24%) of the overall ranking algorithm is the trust/authority of the host domain, which means the number of people that regularly reference a site and therefore trust and find value in it. So the answer, in part, to effective SEO, is to gain referrals and the best way to gain those referrals is to write content that is interesting, valuable, and authoritative enough for others to want to reference it. After that, writers need to promote their mind-blowing content on social networks such as LinkedIn, Twitter, and Facebook to let people know that the content they just can’t write copy without linking to is available and ready for use. SEO may be the new platform, but it’s still all about asking for referrals.